(i) Pilgrims should travel only through approved PTOs (Private Tour Operator) for Umrah. 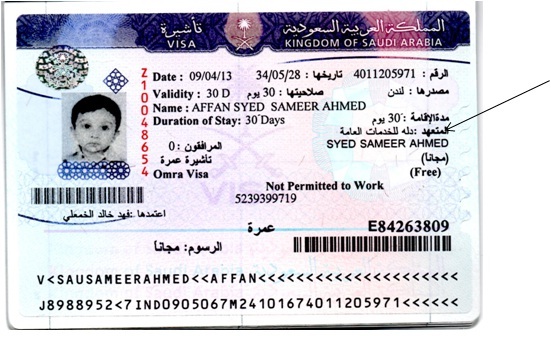 Details of the authorized travel agents in India are available at the website of the Embassy of Saudi Arabia in India at www.saudiembassy.org.in and also on the Saudi Ministry of Haj website http://eservcies.haj.gov.sa/eservices3/umrah/searchExternalAgents.xhtml. (ii) Every tour operator in India is linked to an Umrah company in the Kingdom of Saudi Arabia. The name of the company will be mentioned on the page of Umrah Visa in the pilgrim’s passport. The Umrah visitors are advised to keep the details of the company with them. These details are also available on the website of the Ministry of Haj, Saudi Arabia. Name of the Office Address Tel/Fax No. (v) Never carry drugs, narcotics, Khas-khas (posta poppy seeds) or any such items which are banned in the Kingdom of Saudi Arabia. Last year, 8 persons were arrested for carrying khas-khas. (vi)Be careful while travelling by taxis. Avoid travelling alone in taxis and always try to note the Taxi Registration number. Do not sit in any private vehicle on other’s insistence. (vii)Women should only travel with the Mehram and should not go out alone. While travelling with women by taxi, the men should be the first to board and the last to alight from the taxi. They should not leave women in the taxi. (viii)Never take obligation from unknown persons as this, at times, has resulted in people being cheated after gaining their confidence. (ix)Never leave baggage out of sight and do not carry anything given by strangers without properly checking the contents. (x)Carry minimum cash and valuables while visiting Holy Haram or other crowded places. (xi)Never pick up anything lying in or around Haram Sharief as CCTV cameras are installed in Haram Sharief. Picking up items that do not belong to oneself could result in arrest. (xii)Always keep your belongings with you in Haram Sharief. (xiii)Do not be trapped in fraudulent mobile messages/calls. (xiv)Umrah pilgrims are advised not to take obligation from unknown persons as this, at times, has resulted in people being cheated after gaining their confidence. (xv)Keep a photocopy of your passport, other important documents with you. (xvi)In case of loss/theft of money/ belongings, Umrah pilgrims may contact Indian Haj Office in Makkah/Madinah. a). Copy of death report/death certificate/medical report with English translation. b). Copy of police report with English translation (in case of unnatural death). c). Consent letter from family in India for local burial/transportation of mortal remains to India (duly attested by a Notary) with Arabic translation. d). Copy of Passport of the deceased. xviii The details of the Umrah Service Providers in Saudi Arabia can be seen at the website of Saudi Ministry of Haj at www.haj.gov.sa and http://eservices.haj.gov.sa/eservices3/umrah/uo.xhtml.